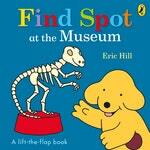 Spot, Mum and Tom can't wait to visit the museum. When Spot goes missing after being distracted by the gift shop, Tom and Mum search high and low, in some unexpected places, before finding him at last. This brand new Spot adventure is full of unexpected lift-the-flap surprises and all the fun and humour that has made the original Where's Spot? a children's classic. A new series based on the key elements of the original Spot lift-the-flap titles, with bold, simple design and unexpected humour. Love Find Spot! At The Museum? Subscribe to Read More to find out about similar books.